The Citi Simplicity® Card is one of the best balance transfer cards around. It has one of the longest 0% Introductory APR periods of any card. The Citi Simplicity® Card can be an excellent tool for consumers who wish to get their credit card debt under control. This card comes with a 21 month 0% APR period on balance transfers and 12 months on purchases–which is among some of the better offers we've seen. After the intro period, the APR will be 16.24% - 26.24%* (Variable), based on your creditworthiness. 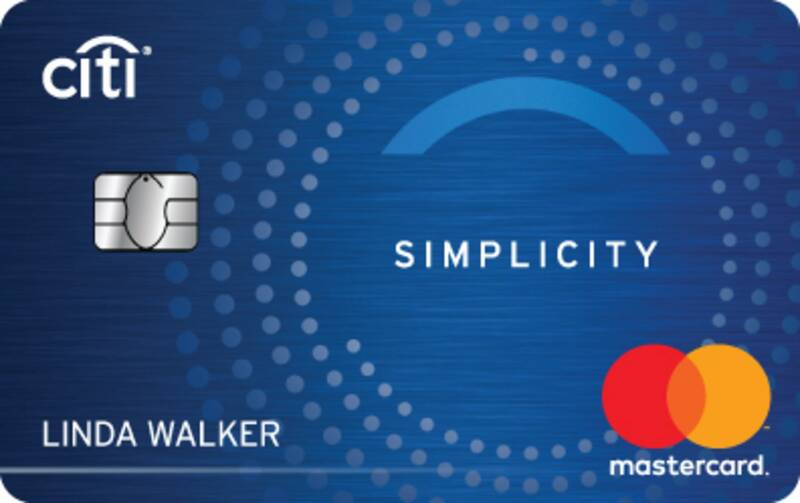 How Does the Citi Simplicity® Card Compare to Other Credit Cards? The Citi Simplicity® Card is a great option if you have a balance on an existing card and are seeking to pay it down quicker, and avoid interest. The 0% intro APR period on purchases and balance transfers gives you ample opportunity to put a dent in your debt. According reports from the Federal Reserve, the average credit card APR for accounts that are assessed interest hovers at around 15%. If you have $10,000 in credit card debt and are making $550 monthly payments on an average card, moving the debt over to the Citi Simplicity® Card can save you as much as $1,255. On top of this, transferring the balance over will also cause you to be rid of the debt sooner than had you stuck with the 15% card. There are never any late fees nor penalty APR on the Citi Simplicity® Card. Most other cards charge as much as $35 dollars for late payments and can raise your APR as high as 29.99%. Keep in mind that other consequences for missing payments can still apply, such as damage to your credit score. We implore consumers to only treat this benefit as a safety net, in case they ever happen to forget a bill. The one area where this card underperforms is in its lack of rewards. If you consistently maintain no monthly balance and pay on-time, the Citi Simplicity® Card really doesn't offer much value. Under these circumstances, Citi and other card companies have a wide array of rewards credit cards that will earn you points, miles or cash back on all your purchases. If you're willing to settle for slightly worse terms, you can also opt for a balance transfer/reward card hybrid, such as the Barclays CashForward™ World Mastercard® or the Chase Freedom®. Bottom Line:The Citi Simplicity® Card is one of the better cards for paying down debt. If you diligently pay off your credit card debt in full every month, however, you'll be better off looking for a reward credit card instead. The main benefit of the Citi Simplicity® Card is the fact that it provides users with 0% intro APR for 21 months on balance transfers. With each transfer to the card, you will have to pay a fee of $5 or 5% of the transfer amount, whichever is greater - this is a standard rate, and is found on most credit cards of this type. After this promotional period ends, your APR will shift to somewhere between 16.24% - 26.24%* (Variable). One of the major reasons we like the Citi Simplicity® Card is that the card can be used to help you regain control over you financial situation. Unfortunately, a scenario we see too often is a cardholder who has accumulated too much credit card debt and ends up spending most of their monthly payments paying off the interest, rather than reducing their total debt. That is where a card like the Citi Simplicity® Card can help. By taking advantage of the intro APR offer new cardholders can transfer their existing credit card balance and begin using their payments to reduce their debt. Marketed as "No Late Fees Ever", the Citi Simplicity® Card does try to differentiate itself with how it handles missed or late payments. Most credit cards we've looked at will charge up to $35 for a late payment which may not be a lot but can add up if it occurs consistently. As its name suggests, the Citi Simplicity® Card does not tack on any fees for late payments, just one small way you could save if you're in this situation. Where the cards features are a big deal is in having No Penalty Rate. Card companies are generally prohibited from adjusting the interest rate on the card unless one of a few things occur. This list can include but is not limited to things such as making a late payment, exceeding your credit limit and having your payment returned. When this does occur however, your card company can raise the APR on your card, often to a rate that is significantly higher than the worst rate initially offered. Many cards we've seen have penalty APRs as high as 29.99%. Having your interest spike up to this amount can be a much larger cost, over time, than a simple $35 late fee. Therefore, the fact that the Citi Simplicity® Card doesn't come with any penalty APR can be a real money saver. In order to help you determine whether the Citi Simplicity® Card is a good fit, we took a look at how it stacks up against some of its competitors. Below we highlight the major strengths and weaknesses of each matchup. The Chase Slate® is one of the few credit cards to waive the transfer fee as an intro offer on balances transferred within the first 60 days of account opening. As a trade-off, the 0% introductory APR only lasts 15 months – 6 months less than the Citi Simplicity® Card. As long as you are diligent about paying your credit card bill, and can pay off your debt in under 15 months, the Chase Slate® will be a better deal. In terms of other features, the Chase Slate® comes with the ability to monitor your FICO score, which can be a nice benefit to individuals working on building their out their credit history. Neither card offers rewards for shopping, making them both less valuable once the promotional period ends. The Barclays CashForward™ World Mastercard® offers both rewards and a 0% intro APR period for balance transfers. As long as you only need 15 months to take care of your outstanding credit card balance, the Barclays CashForward™ World Mastercard® is a better offer. Every purchase you make on it earns you 1.5% cash back, plus a 5% bonus with every redemption. If you pay your bills on time and in full, we recommend going with a reward card like this. If you need more time, there is also the option of applying for both cards. The Citi Simplicity® Card and the Barclays CashForward™ World Mastercard® have no annual fees. As long as you don’t mind opening up multiple new lines of credit, you can have the best of both worlds by applying to the two cards together. The information related to the Barclays CashForward™ World Mastercard® has been collected by ValuePenguin and has not been reviewed or provided by the issuer of this card prior to publication. The Citi® Diamond Preferred® Card is very similar to the Citi Simplicity® Card in that they both offer a 0% intro APR period for balance transfers that spans 21 months. After that, your APR on the Citi® Diamond Preferred® Card will be 14.99% - 24.99% Variable, based on your creditworthinesss. The Citi Simplicity® Card is the more forgiving of the two for customers who might miss a payment every so often. Nevertheless, if you're looking for a balance transfer card to help pay off debt, then either of these cards will be a great help. If you’re still having trouble deciding how the Citi Simplicity® Card compares to other offers, our interactive tool can help you reach a decision. By inputting your current outstanding debt, APR, and minimum monthly payments the tool below will calculate the estimated savings each of these balance transfer credit cards can offer you.